← Eggnog – Love it or hate it? 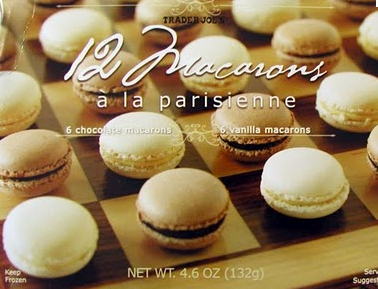 Trader Joe’s Macarons, almost as good as a trip to Paris! Yesterday I served these at a party and I must admit, I ate quite a few. Let me start by saying that the macarons from a bakery are always the best. However, these are a great alternative, and I was thrilled when I spotted them. You can find these in the freezer section. The packaging keeps the fragile cookies from breaking and they need to thaw for 30 minutes. Don’t let them stand at room temperature for too long before serving, because they can get too soft, and lose that great crisp shell. These are perfect for tea/coffee/snacks/impressing friends. And the best part is that they reasonably inexpensive, considering what they are. They are made in 2 flavors; chocolate and vanilla. The vanilla ones are my favorite. I’d love to see these come in more flavors, like strawberry or mocha. A blog called serious eats has some good photos and info on these delicious cookies. So, buy a box or 2, you’ll be glad that you did. You gotta love Trader Joe’s! I’ll look for them when I’m there. thanks. You’ve convinced me to give them a try! Great tag line for these! I’ll be checking them out the next time I go to TJ’s!